New Brazil Cup of Excellence!! This award winning coffee is creamy and decadent. with a silky richness to the texture. A floral aroma precedes and light, soft acidity with hints of apple and a sweet lime. Walnut notes with a touch of rich, milk chocolate round out the extraordinarily smooth and sweet caramel finish. Fazenda Serra Do Bonne is located in the mountains in Araponga in the Mata de Minas area of Minas Gerais. Carlos Sergio Sangland is a committed conservationist. He is resolved to adopt an organic approach to the management of his crops. His coffee which is of the Red and Yellow Catui varietal, and is grown at an altitude of 1200 masl, these coffees regularly defy typical Brazilian cup profiles in favor of much more intense, citric and floral characters. Carlos is committed to high quality execution at every level, performing intensive lot separation, selectively harvesting ripe cherries and drying his pulped natural coffees on elevated beds, providing even ventilation for a much more consistent humidity. This coffee is amazingly smooth with a silky richness to the texture. The cup is dominated by nutty notes, honey flavors, and malt notes. Toasted almonds, honey, and an apricot and lemon sweetness dominate the cup. There is a pleasant brightness in the finish. This award winning farm is acclaimed for exemplary craftsmanship, consistently producing spectacular yellow bourbon coffee, an heirloom variety. Located in a mountainous region in the southern part of Minas Gerais, The geography and microclimate produce optimal conditions for the heirloom Yellow Bourbon, Mondo Novo and Catuai variatels that are grown on the farm. In addition to the 370 hectares of coffee production, the farm possesses 300 additional hectares of rain forest reserves with centennial tree and protected water resources. The property is managed by an agronomist named Jose Renato Gonvalves Dias who uses organic fertilizers produced on the farm to help nurture the plants and ensure that all coffees are prepared in an environmentally-friendly way. This coffee is incredibly sweet with floral aromatics preceding notes of citrus peel, chocolate and a subtle hint of coconut. It has a supple, buttery body and a very smooth finish. The Rwabisindu washing station is located in the Western province, Nyamasheke district and is where this coffee is processed. Owned by Emerth & Gaston Gatsinga, this station serves small farmers from the area. Most farms in Rwanda are 1-3 acres and rely on centralized washing stations to process their coffees. The heirloom Bourbon varietal accounts for nearly all of the coffee produced in Rwanda. The Asociación Chajulense Va’l Vaq Qujol was founded in 1988 by some 40 coffee farmers of the Chajul area Triángulo Ixil, Quiché. Chajul’s main goal is “to promote a sustainable development model that is environmentally sound, economically feasible, fair from a social point of view, and appropriate from a cultural standpoint”. Farmers are continuing to increase their standard of living as well as diversify alternative productions. This coffee is very smooth and rich. Hints of a smokey nuttiness balance delicious notes of grapefruit & orange citrus with a wonderful taste of dark chocolate & cocoa. The soft acidity and silky texture rounds out this full bodied coffee. CoE Colombia – Buena Vista NOW AVAILABLE! Silvio Angel Quipo has owned the Buena Vista Estate for over 20 years and manages it with help of his 3 sons. In the southwest corner of Colombia and at an altitude of 4,000 feet above sea level the volcanic soil, crisp clean mountain air and abundant rays of sunshine combine to create the perfect combination for coffee growing. A cup of Colombian “Buena Vista” offers a sweet and syrupy brew with toffee and nutty (almond & hazelnut) notes and a hint of tangerine citrus and vanilla. This coffee has a huge body and finishes with a sweet, buttery mouth feel. We’re featuring a new Cup of Excellence from El Salvador right now. This one is just as good, if not better, than the Santa Maria we had a little while ago. Drop by and have a cup. This coffee has deep savoury/sweet chocolate nutty fragrance to the freshly ground beans and when it is brewed, it has a very rich and velvety mouth-feel. A light tangy-ness brings forth sweet berry notes with a hint of apricot and peach. The taste finishes with definite thick chocolate notes and a faint hazelnut note that round out an exceptionally smooth finish. This is definitely my fav. coffee right now! 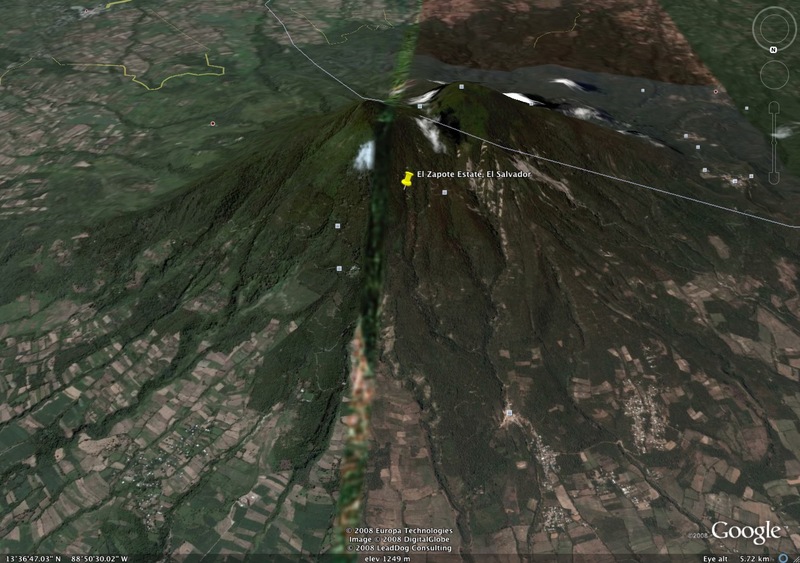 Here’s a pic of where it’s located on the side of a dormant volcano, imagine the views! The Cup of Excellence ~ El Salvador – Santa Maria is now on the menu! The aroma of this coffee is wonderful with a light almond and cinnamon spicy-ness. A very smooth with a velvety mouth-feel are matched with a light tangy-ness. This brings forth a wonderful brown-sugary/molasses sweetness combined with nice citrus-peel marmalade flavour notes. It is perfectly balanced with light almond and chocolate notes that round out a very smooth finish. Drop by and try a cup – delicious! BTW – check out the comments on the previous post about this coffee. There are some comments from people involved with Cup of Excellence in El Salvador! They have provide great links for more info.! Thanks again to them! More tweaking of this very tricky Single Origin Espresso. Even slight changes in temperature, humidity and the age of the bean combine with the challenges of the preparation. Quite a coarse grind in a triple basket with two intermediate tamps and then a ‘full body weight’ tamp at the end. It is incredible done this way and run to about 40 sec. yeilding about 3/4 ounce. The final one I did for myself this morning was delicious … just like I smushed a bunch of blueberries into the portafilter as well. Yum! I didn’t have a chance to finish “dialing in” the El Salvador – Santa Maria yesterday … just a bit too busy. I’ll see if I can squeeze it in today. I did manage to cup the new roast profile of the Medium-Light FTO Sumatra SWP Decaf yesterday. This coffee is great! The decaf’s we’ve been offering on the Clover have always been pretty good. This new roast however is quite sweet and smooth with berry notes and a slight nuttiness. Really, really good … regardless of the fact that it is a decaf.